Last year, when I was on an anti-candida regime, I was scouring the inventories and shelves of online and offline health food stores for sugar-free, gluten-free muesli options. I was about ready to give up, as the mueslis that claimed to be "sugar-free" still had alternative sweeteners or codenames for sugar in their ingredients lists. Then I came across "The Muesli" - a truly sugar-free muesli that offered a gluten-free formula too! I immediately ordered some and was supremely impressed by its premium quality taste, especially at affordable pricing. I was so stoked with the product that I got in contact with the head office and invited myself over for a visit to The Muesli headquarters in Port Melbourne, Victoria. Heather and Kate (pictured above) answered all my questions about their amazing products and I was blown away by the ethos behind their company. They truly are passionate about providing a healthy breakfast option and are sticklers for detail when it comes to ingredients lists. In fact, they created a handy little concept called "The 1 Line Rule", which encourages consumers to check the sugar content of the products they purchase by checking the sugar line on nutrition panels - if it contains more than 5% (5g/100g), put it back on the shelf! I wanted to give them each a big squeeze as I've been using this rule myself for many years!! A few years ago, The Muesli also created "Sugar Free September" - a fun, effective way to get people on the path to healthier living by cutting out as much excess sugar as possible for the month of September. It's a fantastic challenge, and one that can be supported by their great sugar-free muesli! The Muesli offers "classic" and "gluten-free" muesli mixes in single serve sachets as well as full packs of 13 serves - I can vouch that even for a big eater like myself, their single serves are surprisingly filling. All those nuts and seeds make all the difference! They also offer serving suggestions and often feature recipe ideas on their Facebook and Instagram feeds. I've developed an obsession with eating mine with avocado. It's actually become my favourite way to eat muesli! But if you're not a fan, fresh fruit works a treat too (especially berries...mmmmm). Disclaimer: This is not a paid post. I received free products when I visited The Muesli's head office, but this was after I had already purchased their products and raved about them all over social media of my own accord, not at their request. I strongly believe that hummus is ALWAYS better homemade, especially when you live with my housemate Rosie, who's the queen of hummus! I usually leave it to her to whip up a batch, but every so often I get the urge to bust out my food processor and work it hard. So why have I dubbed this Midas Hummus?! Because I've turned it to gold by adding a carrot and some turmeric! 1. Blend all ingredients together in a food process until smooth. Blend less if you prefer chunky hummus. 2. Serve with celery sticks or healthy crackers. One of the most common questions people ask me when they find out that I'm a vegan who loves to cook is, "how do you bake without eggs?!" Although there's an abundance of egg replacers out there, I usually try to avoid them because they're highly processed. I prefer to use flax or chia eggs instead - all you do is grind flax or chia in a coffee grinder until it resembles nut meal, then mix with water to form what I like to call "gooey egg glue". The following recipe uses chia eggs to hold this dairy-free, egg-free, grain-free and soy-free pizza base together. 1. Boil the cauliflower rice for a few minutes and then drain well. Freeze for 10 minutes to cool quickly. 2. Grind chia seeds and mix with water to create chia eggs. Refrigerate for 10 minutes to thicken. 3. Squeeze cooled cauliflower rice in paper towels to remove any excess moisture. 4. Blend all ingredients, including chia eggs, in a high-speed blender and spread mixture onto a baking tray lined with baking paper (I ran out so I had to use foil - definitely not ideal!). 5. Bake at 190C (fan-forced) for half an hour then top with all your favourite ingredients (I used homemade macadamia cheese, finely chopped beetroot/carrot sautéed in coconut oil, and green beans) and re-bake for another 15 minutes. 6. Garnish with parsley or other fresh herbs. *You can replace chia seeds with flax seeds to achieve the same binding effect of eggs. Not only do these sushi rolls look good, they're good for you too! 1. Process cauliflower into cauliflower rice using a blender or food processor on low speed. 2. Blend pesto ingredients and stir pesto through cauliflower rice. 3. Wrap cauliflower rice and veggies in nori sheets using a bamboo mat. 4. Dip in sauce to serve. *This recipe uses pine nuts but you can replace pine nuts with avocado in the pesto to make it a nut-free recipe. There aren't many sweet treats that I still crave from my sugar-sky-high days, but a block of mint chocolate is definitely one. So I've come up with a healthy alternative to satisfy my cravings while still nourishing my body. Chia pudding is another breakfast favourite of mine - I love the consistency and the different flavour combinations I can experiment with. Plus you can really play around with toppings and extras! This one looks a little bit like cement but I SWEAR it's delicious! 1. Shake all ingredients in a large glass jar. 2. Refrigerate overnight in a bowl. 3. Serve chilled with any toppings you like, such as extra chia seeds, berries, banana, coconut, dried fruit, nut butter, fresh fruit, raw activated nuts, refrigerated coconut cream, etc. *You can also use almond milk or another non-dairy milk instead of coconut cream, though it won't set as firm so you might want to use a little less liquid. I've been hooked on quinoa ever since I organised an Amazing Race event around Sydney in 2009. One of the teams dubbed themselves "The Quinoas", piquing my curiosity about this incredible gluten-free grain. It's good for you in so many ways, one of which is it's a complete protein - ideal for vegans like me! 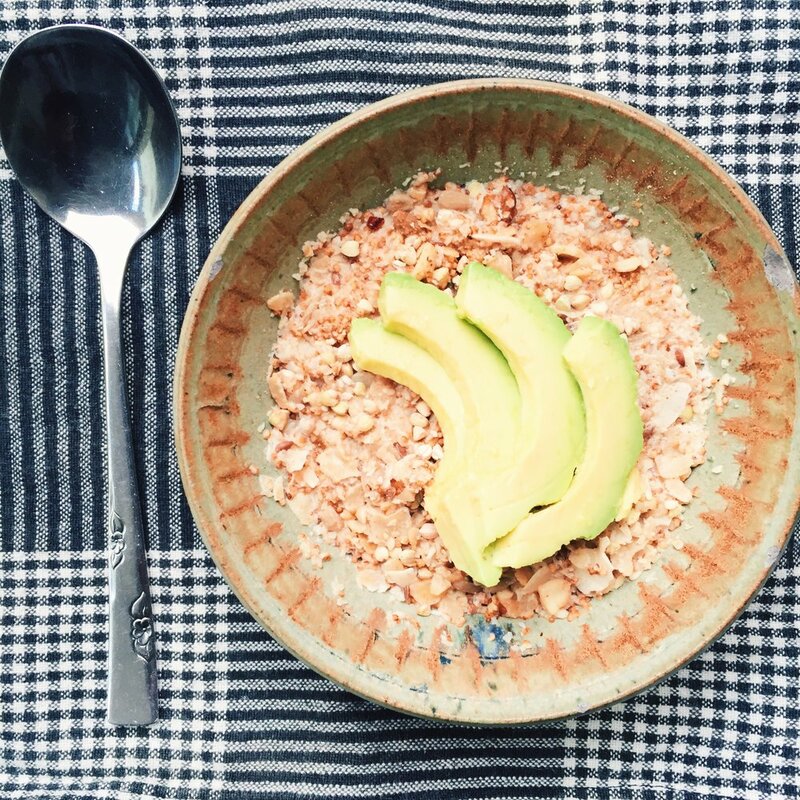 Over the years, quinoa porridge has become a favourite at breakfast time. There are so many different flavours and varieties you can make and this is one of my favourite combinations. 1. Cook quinoa in water and coconut cream for about 12-15 minutes until liquid has evaporated and quinoa is cooked. 2. 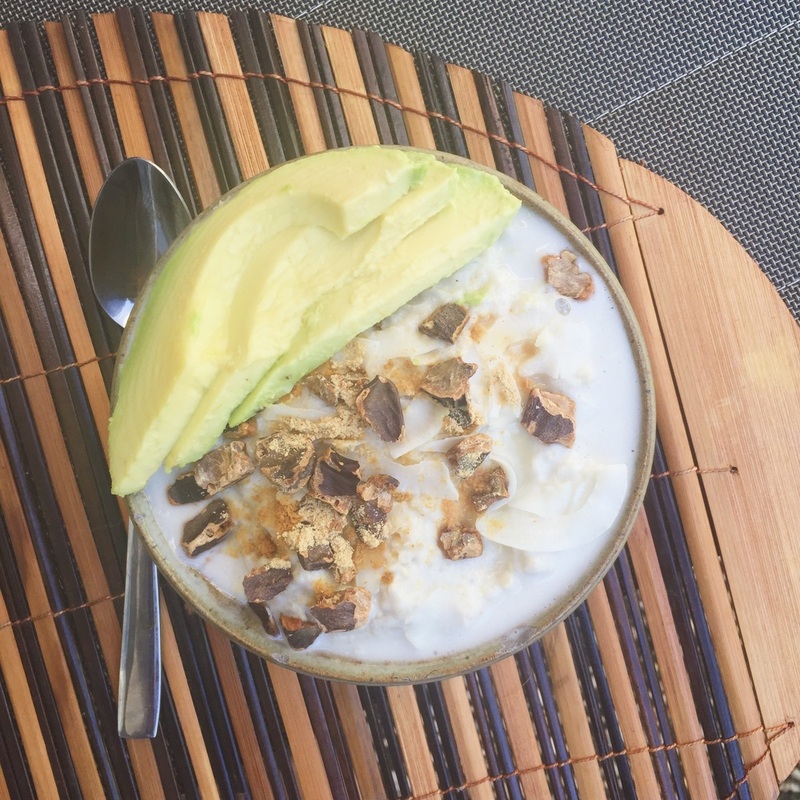 Drown in extra coconut cream and serve with avocado, coconut chips, ground ginger, and carob kibbles. Add coconut nectar if you need sweetener. *Stick it in the fridge for 20 minutes to serve cold on warmer days. Explore Asian's Organic Edamame and Mung Bean Fettuccine is an amazing vegan, gluten-free pasta replacement that provides 24 g of protein per serving! Pairing this pasta with pepitas and macadamia cheese means this mouthwatering meal is pretty much pure protein - the perfect post-workout meal. 1. Cook fettuccine and noodles according to package instructions. 2. Blend pesto ingredients and stir pesto through pasta. 3. Blend cheese ingredients and either stir through pasta or place to the side. 4. Stir through pepitas and sprouts and garnish with broccoli. Sometimes I feel like I'm the only coconutty lunatic who daydreams about quirky raw ice cream combos! Probably because I am. If you'd like to join me on my nice cream adventures, keep reading. My top two favourite foods in the whole wide world are coconut and avocado, so you can imagine my overwhelming excitement when I realised I could make ice cream out of these terrific two! I used Ayam coconut cream this time, but I'm keen to make my own coconut cream in future - I have a coconut scraper that I got in Fiji sitting in a kitchen drawer just longing to get in on the action. This ice cream has a soft serve consistency that will appeal to even tiny tots. Make sure to add lots of coconut nectar if you have a sweet tooth. The carob adds some sweetness, but the avocado and coconut cream aren't exactly high in sugar. That's kind of why I used them, as I'm off all sugars (even fruit!) until January. 1. Blend frozen avocado, coconut cream ice cubes, coconut flesh and water, and lemon juice together in a high-speed food processor or blender. 2. Serve with coconut chips, fresh avocado, and carob kibbles. *This recipe isn't very sweet without coconut nectar and that's how I like it right now while on my anti-fungal livet. Add coconut nectar if you want it to be sweet. I wake up between 4 and 4.30am most days, yet I still find myself rushing through my mornings. This morning, I decided to treat myself to a picnic on the beach. I'd seen a recipe for Rainbow Soba Salad on the Whole Foods app that inspired me to make a noodle salad for breakfast. This salad is full of vegetables and flavour - the perfect salad for a picnic! 1. Cook sweet potato noodles according to packet instructions (takes about 8 minutes). 2. While noodles are cooking, saute garlic and ginger in coconut oil for a few minutes. 3. Add the carrot, sweet potato, and beetroot, cover, and cook for about 10 minutes, until noodles are cooked (the root veggies don't need to be fully tender). 4. Rinse noodles under cold water and drain well. 5. Toss noodles, root veggies, and kale together. 6. Top with sesame seeds and pistachios. *You can use different vegetables to what I used. I used very different veggies to the Whole Foods recipe - in fact, I also added garlic and ginger and made it into a completely different recipe. I'm the WORST at following recipes (even my own haha). If you're looking for a hearty, easy vegan meal, this is the curry for you! Even if you're not vegan, I think you'll appreciate the delicious flavours and the health benefits of red lentils are awesome: high protein supply, a healthy heart, and weight loss! 1. Chop garlic and onion and saute in oil with turmeric and salt until fragrant. 2. Chop all veggies and throw in with lentils and water, simmering, covered, for 20 minutes. 3. Serve over quinoa or enjoy alone. 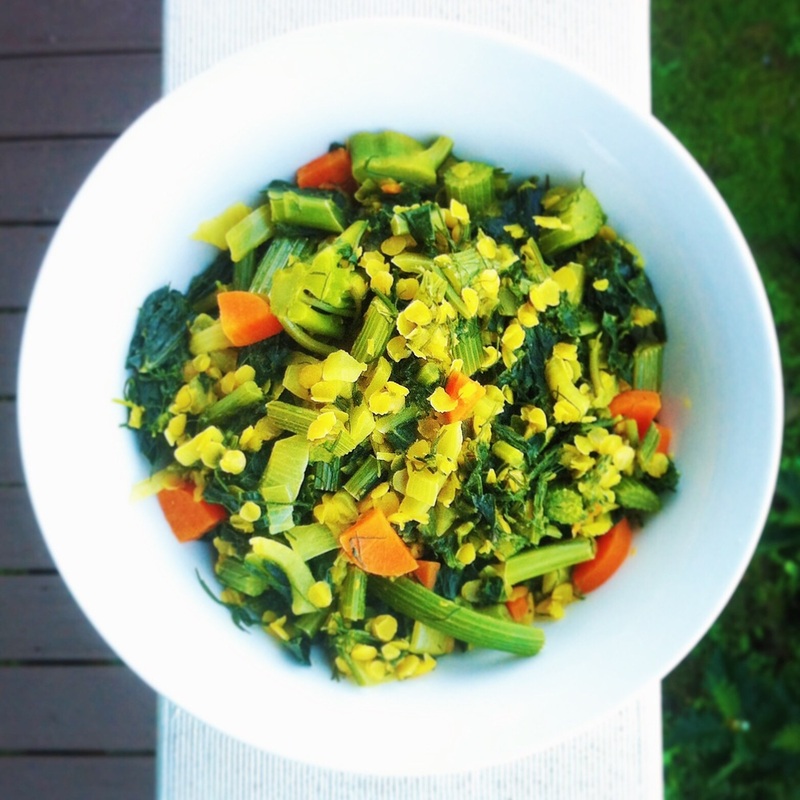 *You can use any greens you like - curries are great for using up veggies! These carob hemp balls are excellent for a nutritious hit on the go and are full of protein and healthy fats! As someone who flies between two locations (I live on the Gold Coast but my family is in Sydney) and is constantly driving between Byron Bay and Brissy for speaking engagements, musical performances, and just general adventuring, eating healthy on the run can be challenging. Balls are definitely the solution to this first-world problem of mine. I just throw a bunch of ingredients into a food processor, form into balls, refrigerate overnight, and Bob's your uncle! 1. Pulse sunflower kernels and pepitas in a food processor until a meal forms (be careful that it doesn't become a butter consistency). 2. Add the rest of the ingredients and process until mixture clumps together. 3. Form mixture into balls and roll balls in either hemp seeds or coconut. *Make sure you use coconut oil as it's essential for the balls to set. If you grew up in the 90s like me, the word "cabbage" used to conjure thoughts of useless, overpriced dolls called "Cabbage Patch Kids", rather than vegetables. These days, my evangelism of vegetables has thoroughly increased my appreciation for these densely leafy plants and I can't sing their praises enough. So why are cabbages so cool? 1. They go well with everything - you can toss them in salads, soak them in soups, saute them in stir-fries...the possibilities are endless! 2. They help boost the immune system - their abundance of vitamins protects the body against disease. Cabbage is especially high in Vitamins C and E, both important immune-boosting vitamins. 3. Red cabbages are loaded with antioxidants - that beautiful bright colour isn't just for aesthetics' sake! The polyphenols in red cabbages work wonders, namely in eliminating toxins and fighting free radicals that could otherwise cause cancer. 4. They reduce inflammation - cabbages are packed with nutrients that can help prevent swelling in the body and therefore reduce chronic inflammation. 5. They boost heart health - cabbage binds with bile acids in your stomach, which means they're not absorbed into your body. This also means the cholesterol they contain leave the body through the intestines instead of being absorbed! Not that I'm intending to neglect the other ingredients in this tasty recipe...I just really love cabbage! But let's get back on track. You may find it hard to believe how easy these chips were to make. I promise you I'm giving you the exact easy peasy recipe I used. All it takes is less than 10 ingredients altogether! 1. Tear the cabbage leaves into two or three pieces. 2. Blanch cabbage leaves in boiling water then rinse under cold water. 3. Drain leaves and dry with paper towels. 4. Season with salt and oregano. 5. Bake at 100 C (fan-forced) for at least two hours - even more if you want them extra crispy. 1. Combine oil, salt, and lemon myrtle in a bowl. 2. Toss sweet potato rounds in dressing until evenly coated. 3. Bake at 180 C (fan-forced) for at least half an hour, flipping regularly. 1. Combine oil and salt. 2. Toss kale thoroughly in oil until evenly coated. 3. Bake at 150 C (fan-forced) for 10 minutes until crisp. 2. Top with chopped pistachios and hemp seeds. *These are best eaten fresh and the recipe is easy enough that you can make them fresh all the time! Last week at Murwillumbah Markets the bright, beautiful leaves of a local red cabbage caught my eye and before I knew it my market bag was graced with its striking purple presence. Oh what fun, delightful recipe ideas filled this salad lover's mind! That same morning at the markets, I picked up a fresh jar of Nudgel Nuts macadamia butter. I've been obsessed with maca butter since I first discovered the Nudgel Nuts stand a couple of years ago. Sometimes I have maca butter with every meal, and sometimes I just eat it by the spoonful straight out of the jar (call me an extremist, but I'd rather go by the title of maca butter enthusiast). This morning, my weekly adventure to Currumbin Valley Harvest left me laden with veggies - this recipe is made up almost entirely of ingredients from both Murwillumbah Markets and Currumbin Valley Harvest. I strongly believe in the importance of low food miles, not only for freshness but also to support local farmers. These cabbage cups are quick and easy, with a flavoursome, tangy macadamia butter sauce - any excuse to show a little maca butter love! 1. Cook the spring onions and garlic in coconut oil for a few minutes, until fragrant. 2. Add tomatoes, eggplant, snow peas, lemon juice, thyme and salt and cook for 10 minutes, until eggplant is tender. 3. While the veggies are cooking, blend cauliflower into rice using a blender or food processor on low speed. 4. Add cauliflower rice to veggies and continue cooking for 5 minutes. 5. Blend all sauce ingredients until smooth and well combined. 6. 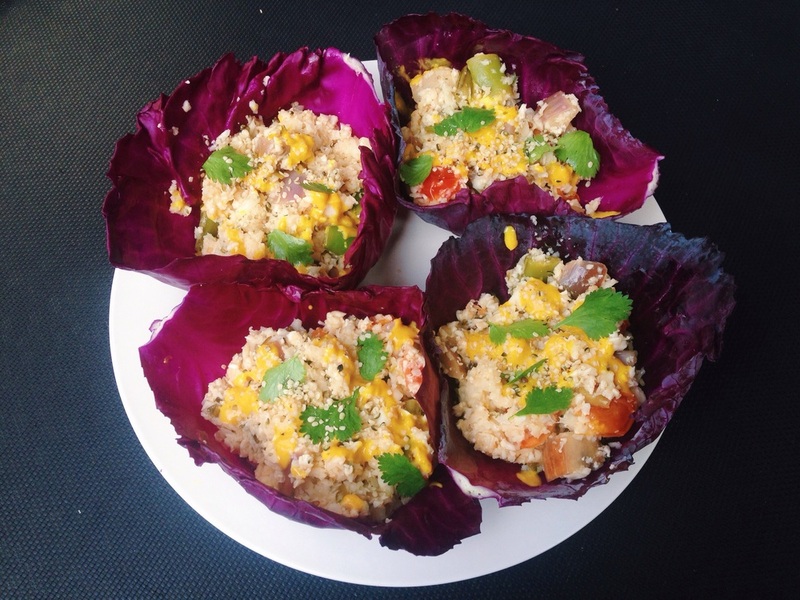 Scoop cauliflower rice into cabbage leaves, drizzle with sauce, and top with coriander and hemp seeds. *You can also grate the cauliflower to achieve a rice consistency. I have a big bag of hemp flour in my pantry that a generous friend gave to me (knowing that I'm a big fan of hemp) so I'm always thinking of ways to incorporate hemp flour into my baking. I also threw some bright veggies into the mix for extra nutrition as I'm all about eating the rainbow! The ruby chard is from Sylva Lining Organics - Sylva is a super friendly farmer who has a stall at Murwillumbah Markets every Wednesday morning. She's taught me so much about so many different greens. Ruby chard has all the benefits of kale, but tastes sweeter, and in my opinion, is way prettier! I do love bread, so you may see a few bread recipes pop up from me, since I find it so difficult to buy Sisi-friendly bread. It's one of my favourite things to experiment with! If you have any other suggestions as to how I can use my hemp flour I'd love to hear them! Please feel free to comment below. 1. Mix ground flax and water together, then refrigerate for 10 minutes to thicken. 2. 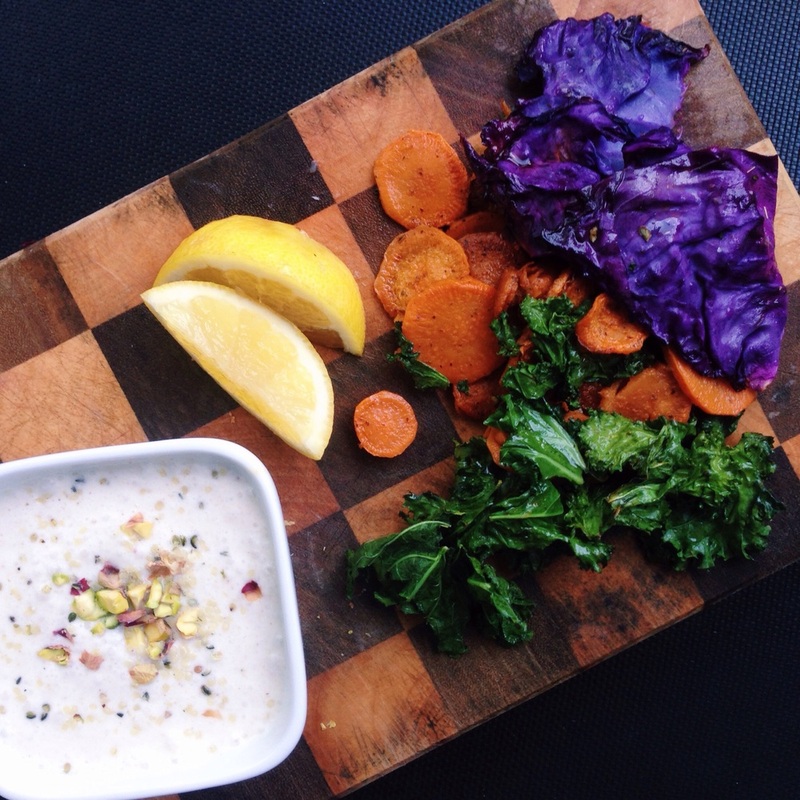 Prepare veggies while flax is thickening. 3. Combine flax gel, coconut oil, and tahini. 4. Add ground nuts and hemp flour and mix well. 5. Mix in veggies, essential oil, rosemary, and salt. 6. Pour into a baking tin and top with seeds. 7. Bake at 170C (fan-forced) for an hour. 8. Allow to cool before slicing and serving. *Best served toasted with avocado or nut butter. You've probably heard of the lemon detox diet (not one that I recommend), but have you heard of Sisi-friendly lemon detox balls? They provide the same detoxifying effects without robbing your body of the nutrition you need. In fact, these seedy, fruity balls are packed with superfoods to nourish your body! 1. Process seeds and buckwheat in a food processor until a meal/flour consistency is achieved. Set aside. 2. Process dried fruit until it all clumps together. 3. Add seed meal, lemon juice and lemon rind and process until well combined. 4. Form your mix into balls and roll in desiccated coconut. 5. Refrigerate balls to firm up before serving. *You can also store these in the freezer (if you don't devour them all in one go!). It's hard to believe with the glorious sunny weather we've been having on the Gold Coast, but it's still officially winter here! The chilly mornings make me crave warm comfort food like this hearty soup. The secret ingredient to its tantalising aroma is a special essential oil blend that is fast becoming a favourite in savoury cooking for me. Fennel is also a favourite of mine - it's an excellent source of vitamin C, which is vital for the immune system and has strong antioxidant-promoting effects. This recipe is vegan, gluten-free and soy-free! 1. Saute eschallot, garlic and turmeric in coconut oil until fragrant, about 3 minutes. 2. Add all fennel bits and saute for another 7 minutes. 3. Add sweet potato, rosemary, water and essential oil blend and simmer until sweet potato is cooked, about 15 minutes. 4. Cool slightly and blend in high-speed blender until smooth. 5. Garnish with parsley and coconut cream. Note: you can replace the eschallot with red or brown onion. The only time I will ever use the term "get stuffed" is when I'm talking to one of my favourite vegetables, the commendable capsicum. These stuffed capsicums are gluten-free and 100% plant-based. This is literally one of my tastiest, yummiest, most mouth-watering and flavoursome recipes to date. I've been wanting to write a blog post on these since I first made them on the weekend and seeing as my blog is now officially live (yay!) I decided I'd make them again this morning (double yay!) to remind myself of the ingredients and steps I used. I'm a big fan of Middle Eastern cuisine because of its freshness and flavour and also a big Mexican food lover (there's never a bad time for guac!) so stuffing capsicums with falafel just seemed to make sense in my mind, and then serving them with avocado sauce seemed like an even better idea! I only had one capsicum and heaps of stuffing so I ended up making several small falafel patties too - these are perfect to fill a lunch box for school or work! 1. 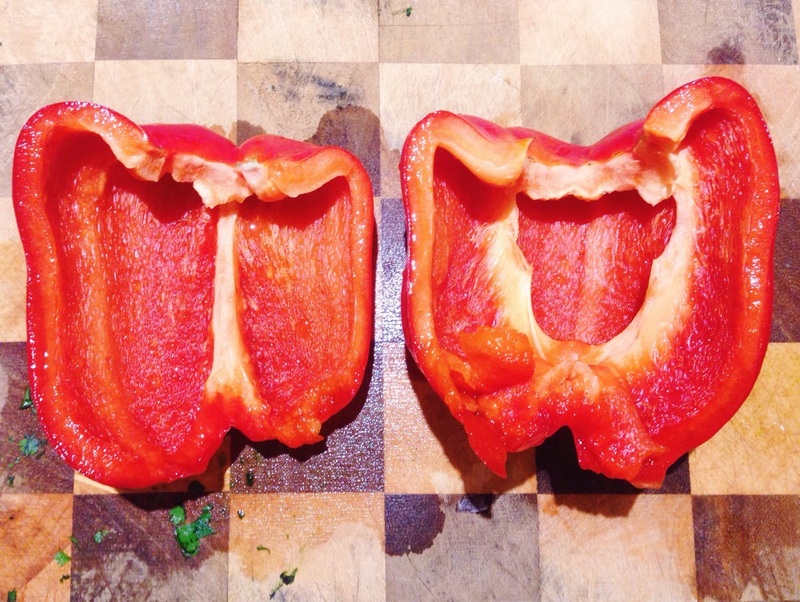 Slice the capsicums in half and de-seed. 2. Pre-heat the oven to 190 C.
3. Toss all falafel ingredients into a food processor and pulse away until everything is holding together but a bit soggy. 4. Scoop mixture into capsicum halves and form remaining stuffing into slightly soggy falafel patties. 5. Place patties onto a baking-paper-lined tray for 25 minutes, until browned on the outside. 6. Blend sauce ingredients and serve stuffed capsicums and falafels with avocado and Hawaiian red alaea salt, avocado sauce, lime wedges, and a smattering of hemp seeds and activated raw pumpkin kernels. There you go! A Sisi-friendly, slightly Mexican spin on traditional falafel that's packed with nutrients and flavour! I was blessed to be in Hawaii for 16 days in April, helping out at a free community health expo and presenting health seminars. While I was there, I really wanted to make a raw cheesecake for our team as there were many team members who had never tried raw desserts before! Needless to say, they all enjoyed the experience! Some of them went a bit crazy at cake o'clock! I wanted to create something using iconic Hawaiian ingredients, which is why I chose macadamias instead of cashews. I'd always thought macadamias were an Aussie nut, but it turns out Hawaii has a $40 million macadamia nut industry! Trust and believe me when I tell you this recipe is yummy, creamy, zesty, and fruity - please try it yourself! 1⃣ Process 2 cups of nuts (set remaining 3 cups aside for filling) with dates and coconut (save some for garnish) in a food processor until well blended and sticky. 2⃣ Press mixture into the lined base of a 9" springform cake tin. 3⃣ Set aside in freezer. 1⃣ Blend the remaining nuts, lime juice, coconut nectar, coconut oil, and salt until very smooth (I alternated between food processor and Vitamix to get the consistency right). 2⃣ Pour mixture onto base and distribute evenly with spatula. 1⃣ Blend all ingredients until smooth. 2⃣ Pour onto filling and freeze for a few hours. 3⃣ Remove from freezer 20 minutes before serving and garnish with coconut. ✴️ Please don't substitute the coconut oil with any other oil - it's the secret ingredient to getting the cake to set. All other ingredients can be adjusted according to your taste. All ingredients purchased from Down to Earth Organic and Natural retailers, my favourite stores in Hawaii! ✅ Coconut oil actually raises HDL (good cholesterol), despite the bad rap it's had over the years - previous studies that condemned it were performed on partially hydrogenated coconut oil rather than raw, cold-pressed virgin coconut oil. Give it a go and treat yourself, or surprise a friend with a deliciously healthy birthday cake! Delicious, cheap and easy vegan quinoa sushi! Yummy! 1⃣ Cook quinoa in water, ground ginger, thyme and salt for 15 minutes. 2⃣ When quinoa is cooked and cooled, stir through lemon juice and tahini, and season with black salt to taste. 3⃣ Place enough quinoa on a nori sheet (with bamboo mat underneath) to create a thin quinoa layer covering the entire nori sheet except the edge furthest from you. 4⃣ Top with all other ingredients and use the bamboo mat to roll the sushi, finishing with a few drops of water on the outer edge to seal the sushi. 5⃣ Slice sushi into pieces of desired size. ✴️ I recommend that you use a bamboo mat to roll the sushi. Or if you're Hawaiian use a musubi press! ✅ Nori is high in both magnesium and calcium, which makes it the ideal bone-builder!